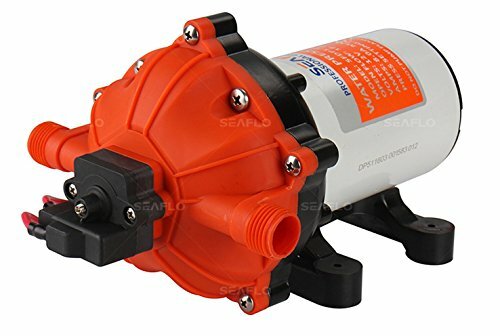 SEAFLO 110V 3.3 GPM 45 PSI Water Diaphragm Pressure Pump - 4 Year Warranty!!! 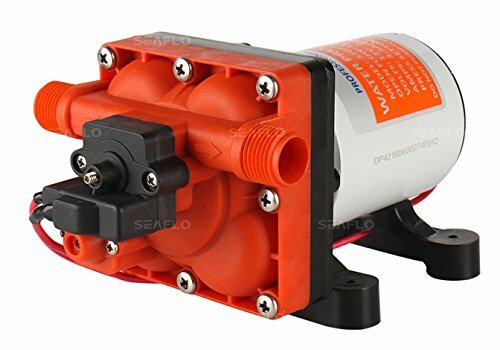 SEAFLO 42-Series Water Pressure Diaphragm Pump w/ Internal Bypass - 12V, 3.0 GPM, 55 PSI Meet our newest addition to our diaphragm pumps: the 42 series. UL 778 & CSA 22.2 Certified. It retains the raw power and pressure of its predecessors, but also can adapt to situations where huge flow is not needed. Compact but capable, it is a great fit for tight spaces. It may also be configured with different inlet types, each with their own unique fittings to be sure that it fits any application you can require. It also features an internal bypass to reduce pump cycling. No accumulator tank needed! Our 42-Series will perform optimally under both high flow and low flow. It also features self-priming and priming up to 6 vertical feet while operating quietly during any application. 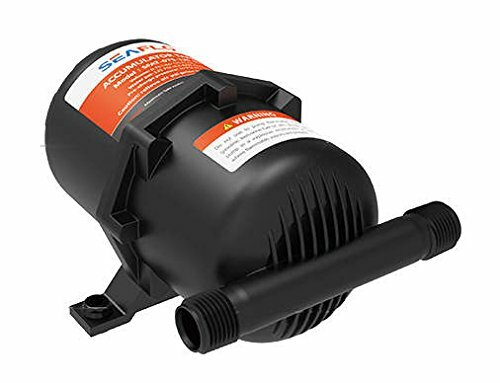 This pump is capable of running dry and even contains a built-in check valve. Lastly, as will all SEAFLO products, it comes with a 4-Year Limited Warranty! Variable Flow With Bypass Technology For Reduced Cycling! 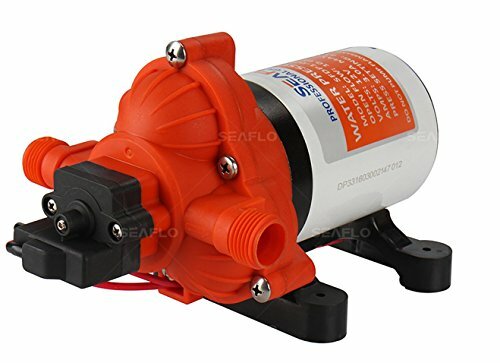 DC 12V Fresh Water Diaphragm Self Priming Pressure Pump 100% Brand New . 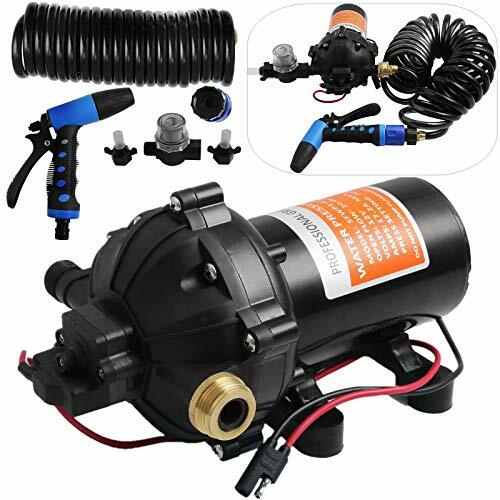 High Quality Powerful automatic pressure pump 1.2 Gallons Per Minute (4.3 LPM) Capacity flow- and 35 PSI pressure Extremely efficient- very low current draw . 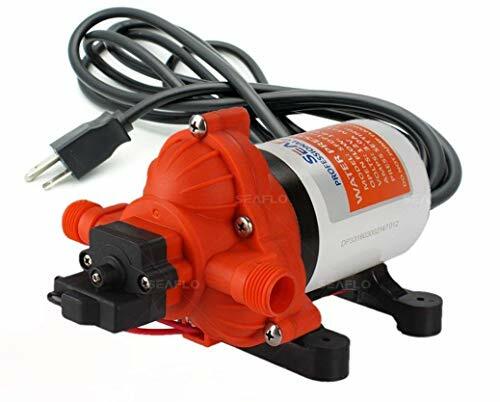 Thermal overload and ignition protection Easy connecting system Low power draw Soft rubber mounts Professional grade pump . Hose Outlets : Fixed 10mm (0.4inch) diam. Easy to install and service! Accumulator tanks hold a reservoir of air down stream from the pump. The air acts as a cushion, absorbing pump and pressure fluctuations, smoothing the flow and making the system quieter. 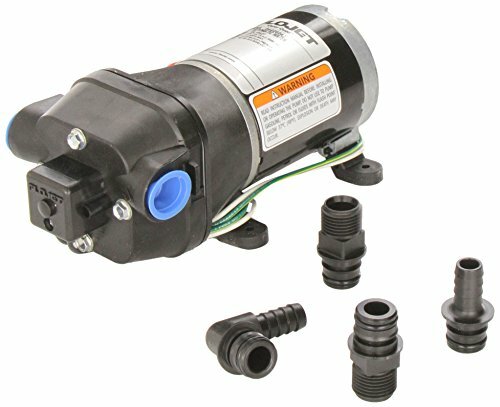 Accumulators allow the pump to reach shut-off pressure more smoothly which reduces the on/off cycle giving better control of water delivery. The 51-Series is our most heavy-duty water pump. It provides high volume water flow with reduced pump cycling thanks to the large five-chamber diaphragm. It provides up to 5.5 gallons per minute. 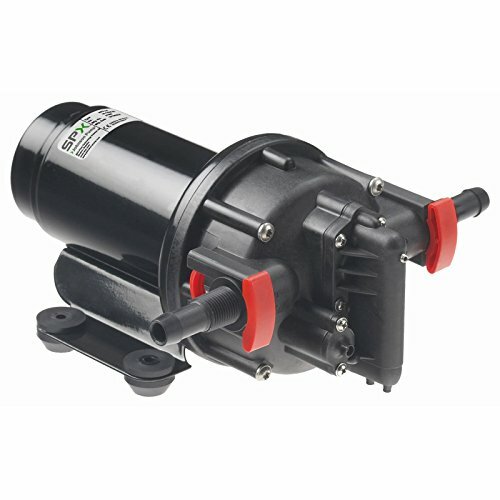 The 51-Series pumps are self-priming, can run dry without damage, and are performance reliable and low current. This automatic demand water system pump has a built-in pressure switch which automatically starts and stops the pump when the faucet is opened and closed. They are easy to install service and winterize. This pump works best when paired with a SEAFLO Accumulator Tank. 1. Self-Priming : Allows for usage even if located above water tank. 2. 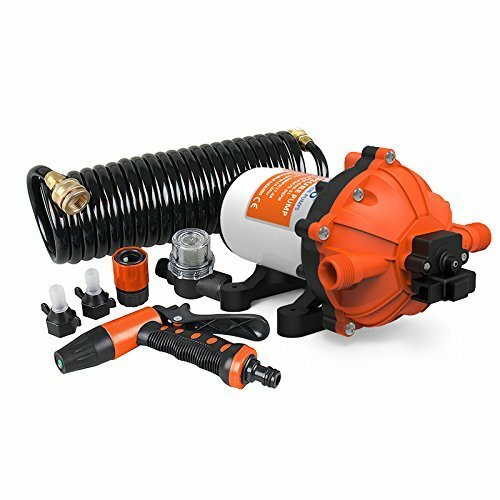 Built-in 40 PSI pressure switch automatically starts and stops the pump when necessary. 4.Capable of being run dry without damage.Quiet operation,Overheating protection and safety Working. 5 Professional Grade Pump Ideal for automotive marine/RV/caravans, agricultural spraying, general industrial, sprayer fixtures. 1.When the pressure switch stops,the pressure is 40 PSI. 2.Special value for liquid input and output. 3.Please clean it regularly in case of debris blockage.If the pump is stuck by something like Mud.it need to be cleaned with clean water before use. 4.Rated Flow is 4.5GPM(17 LPM).Long Time Operation at Small Flow/Leakage Would Damage Pressure Switch Very Quickly. Self-Priming : Allows for usage even if located above water tank. 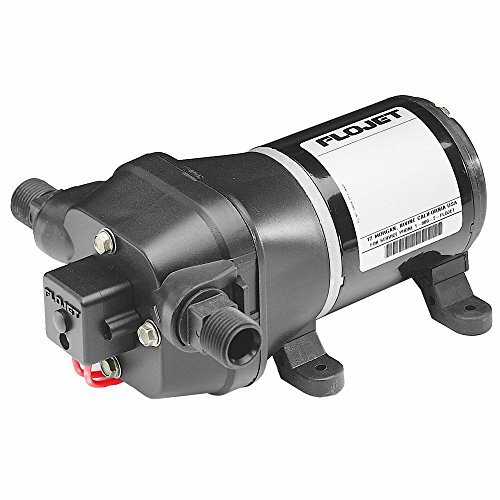 Built-in 40 PSI pressure switch automatically starts and stops the pump when necessary. 4 Year Warranty from Authorized Seaflo USA Dealer!!! 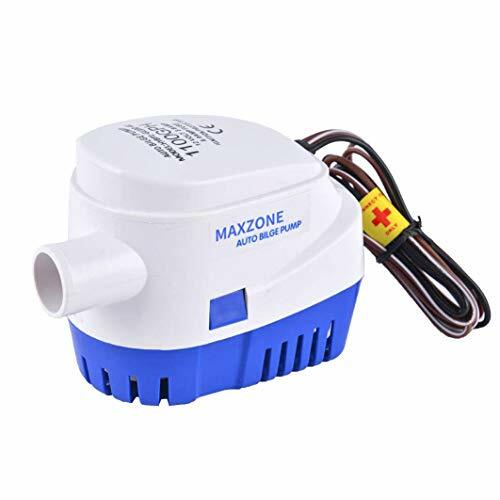 [MAIN PARAMETER] ~ Voltage: 12V DC ; Flow Capacity: 5.5 Gallons Per Minute ; Water Pressure: 70 PSI (4.8 bar) ; Nozzle Open Pressure: 55 PSI (3.8 bar) ; Hose Outlets: Suits 1/2" Diam Hose ; Twin Core Wire ; Current Draw: 17.2 Amp (Max 20 Amp) ; Duty Cycle: 30 mins ; Accessories: 1 x Trigger Nozzle with Quick Connect, 1 x Quick Connect Adaptor, 1 x UV-protected 25' Coiled Hose, 2 x NPT Connectors with 1/2" Straight Barb, 1 x Universal Saltwater Filter/Straine. 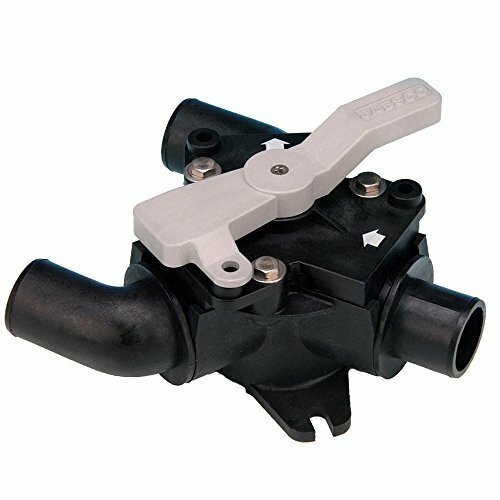 [HIGH-QUALITY MATERIAL] ~ The main body of the 5-chamber positive displacement diaphragm pump is made of ABS engineering plastic, which is one-piece, tightly sealed and durable. 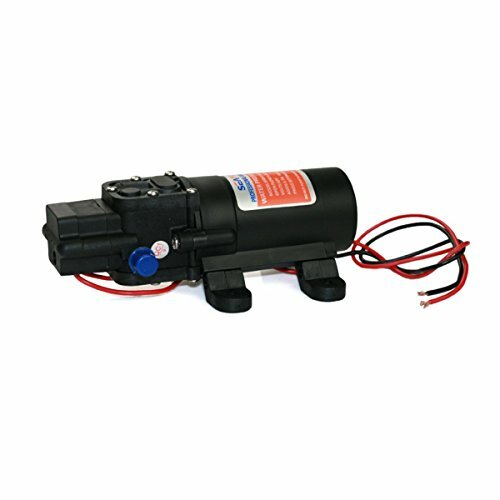 A high-powered motor with a waterproof cover and a sealed pressure switch ensure that the pump operates in harsh environments. Rubber mounting feet reduce noise and prevent corrosion. [EASY CONNECTING] ~ Externally threaded port pump heads are available in a variety of sizes and mounting styles for easy connection to any outlet. The threaded connection of the water pipe is made of high quality brass and the filter can be removed for cleaning. [SUPERIOR PERFORMANCE] ~ The self-priming 12V pump is equipped with an automatic pressure switch control that automatically opens and closes when you open and close the nozzle. In addition, the pump has built-in thermal overload protection, and when the motor overheats, the pump will automatically stop running. Once the temperature has dropped to an acceptable range, the pump will automatically restart. 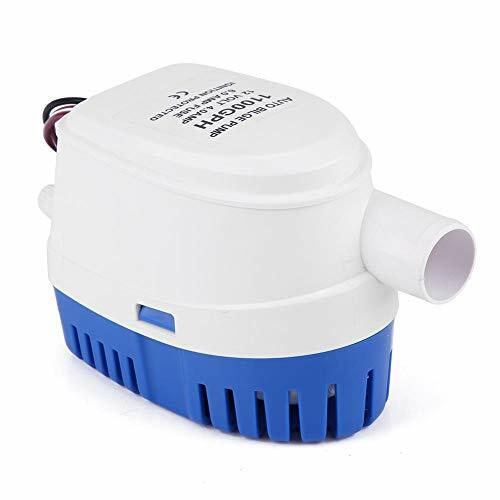 [WIDE APPLICATION] ~ The 12v water pump is designed for intermittent use with a duty cycle of 30 minutes and is suitable for fresh or salt water. 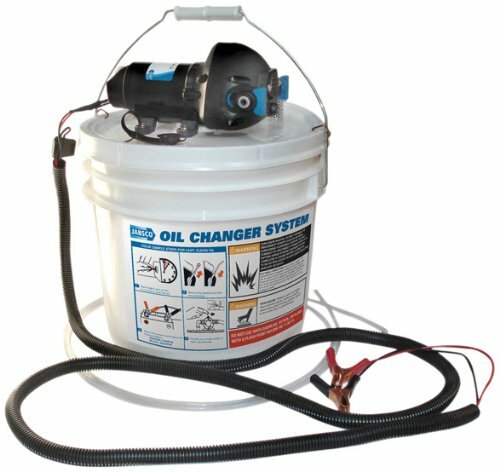 Ideal for cleaning boats, fish tanks, anchor chains, beacon stations and boats. It can also be used to clean ships, RVs and leisure decks. 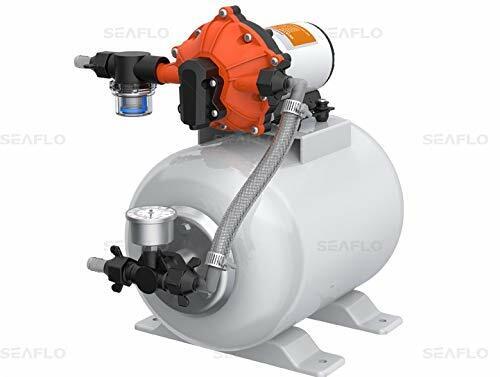 Quiet and pulsation free even at low speeds, the Aqua Jet five chamber diaphragm pump provides the perfect water pressure solution for both small and medium sized leisure and commercial boats. Efficient and compact, Aqua Jet pumps are particularly suitable where low amperage and sounds levels in relation to water flow are placed at a premium - such as in shower and galley applications. Operates in fresh or sea water. Self priming. It is recommended to install pump with an accumulator tank. Always use a PUM Protector inlet strainer before the pump intake. 100 watt motor with PP/PPA body, EPDM valves and santoprene diaphragm. 9.46" L x 8.42" W x 4.33" H. Weight: 4.5 lbs. 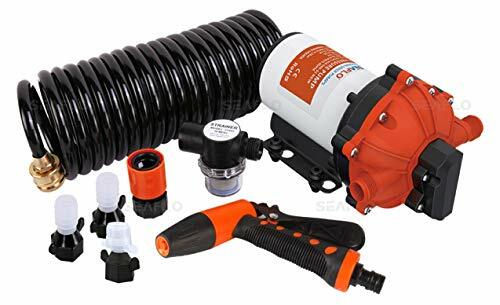 Capacity: 4.0 GPM/Pressure Cut-Off: 41 psi/Fuse Size: 10 Amp/Connection: 3/8" NPT/hose/1/2", 1/2" NPT/hose 3/4"; 1/2" NPT, 3/4" hose. Temperature Limits:140 F (60 C) Max. Duty Cycle: Intermittent. Leads: 16 AWG, 4.5" long with 2-Pin connector/Leads. 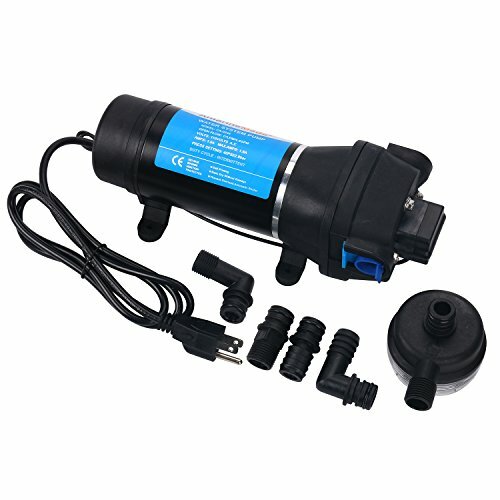 This is an automatic and submersible pump which can be used in boat bilges, pools or other applications where you have to remove water from. 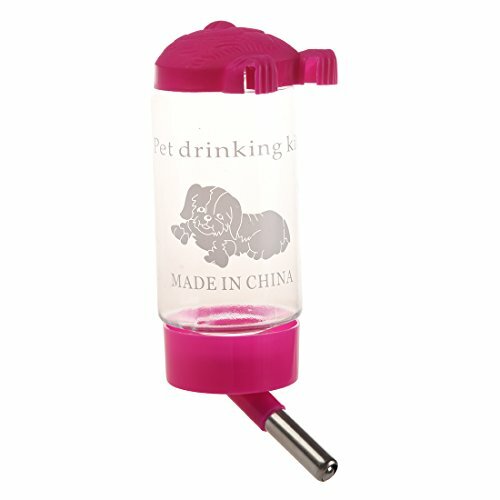 Made of high quality PVC and copper material, rustproof and corrosion resistant, features with ignition protection, anti-air lock protection and will not burn out when run dry, quality and performance guaranteed! Application: Can be used in boat bilges, pools or other applications where you have to remove water from. These pumps are designed for intermittent use only, not designed for continuous use! The 55-Series is our heavy duty pump with the most robust pressure switch on the market. It provides high volume water flow with reduced pump cycling thanks to the large five-chamber diaphragm and a 2 gallon accumulator tank. It provides up to 5.5 gallons per minute. 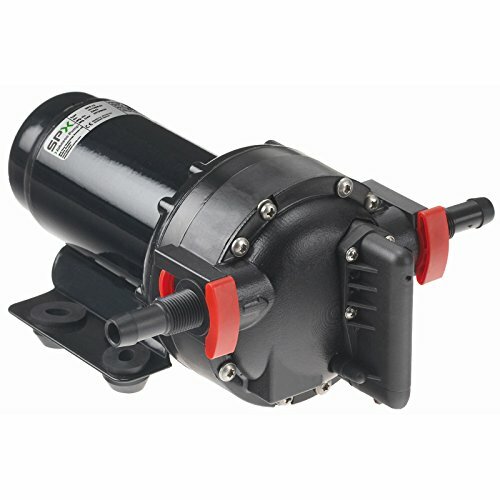 The 55-Series pumps are self-priming, can run dry without damage, and are performance reliable. This automatic demand water system pump has a built-in pressure switch which automatically starts and stops the pump when the faucet is opened and closed. They are easy to install, service, and winterize. This pump works best when paired with the included SEAFLO Accumulator Tank. Get everything you need in one convenient kit! 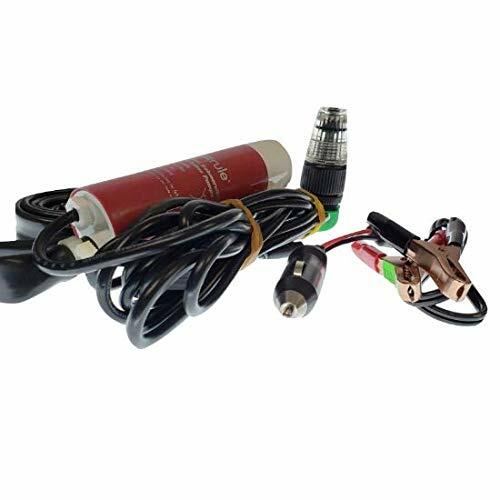 Each kit comes with a iL280PK 12V submersible pump with quick disconnect fitting, a battery terminal power adapter, 8' lay flat hose and spray nozzle. Can pump 280GPH gallons per hour (4.66 gallons per minute) of water. For marine, RV, and recreational deck wash applications Suitable use with for fresh water or saltwater. Designed for intermittent use only.